The crisis in Iraq must be dealt with through the UN but a failure to act could result in "bloody consequences", Prime Minister Tony Blair has warned. Mr Blair said weapons inspectors should get more time to try to establish the truth about weapons of mass destruction. But, in a passionate speech to the Labour Party's spring conference in Glasgow, he also insisted there was a strong "moral case" for toppling Saddam Hussein by force. As he spoke on Saturday morning hundreds of thousands of people gathered for anti-war marches across the UK. Giving his first reaction to chief UN weapons inspector Hans Blix's report to the Security Council on Friday, the prime minister told his party's delegates he would wait for a further report to be presented to the UN on February 28. However, Mr Blair said: "If we show weakness now, if we allow the plea for more time to become just an excuse for prevarication until the moment for action passes, then it will not only be Saddam who is repeating history. "The menace, and not just from Saddam, will grow; the authority of the UN will be lost; and the conflict when it comes will be more bloody." He said: "Ridding the world of Saddam would be an act of humanity. It is leaving him there that is in truth inhumane." 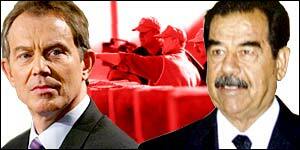 However, Mr Blair was dismissive of recent concessions by the Iraqi dictator, warning: "The concessions are suspect. Unfortunately, the weapons are real." Friday's report by Mr Blix called for more time to be given to inspections and said Saddam Hussein's regime was improving co-operation. Mr Blair said: "The time needed is not the time it takes the inspectors to discover the weapons. "They are not a detective agency. "The time is the time necessary to make a judgement - is Saddam prepared to co-operate fully or not?" "If he is, the inspectors can take as much time as they want." The speech, which took place at 1030GMT on Saturday, is thought to have been rescheduled to avoid a clash with an anti-war rally outside the conference centre. In the address, Mr Blair expressed respect for anti-war protesters' convictions and rights to demonstrate. He conceded it was still possible for Iraqi president Saddam Hussein to prevent military action by co-operating with the weapons inspectors. But he insisted the international community must not show weakness. Responding to the prime minister's speech, a Conservative Party spokesman said: "In common with the Prime Minister, Iain Duncan Smith has supported the case for disarming Saddam Hussein by force if necessary." Mr Blair also asked what had prompted thousands of people to take to the streets to oppose a war against Iraq. "It is a right, an entirely understandable hatred of war," he said. "It is feeling of moral purpose and I respect that." Mr Blair recognised a war would lead to innocent people dying and "real consequences" but he said no action would still leave Saddam in power. Addressing his words directly to those marching for peace, he added: "I do not seek unpopularity as a badge of honour but sometimes it is the price of leadership and cost of conviction." The conference has a tight timetable, which is focused away from the international crisis. Heavy security surrounded the conference centre during the morning's proceedings with venue bosses having banned the use of amplifiers in the car park following a request from Labour. "Mr Blair send there was a moral case for action"
Anti-war protest: Will it make a difference?